The method of which a hose fitting is attached to hose is an important decision. When making this decision, there are certain considerations that have to be addressed, such as working pressures, working temperatures and the media going through the hose. ADT Can advise you of the best attachment method for your application. Worm drive hose clips for low pressure applications. Available in mild or stainless steel. Sizes range from 9.5mm to 318 mm. Multiband, housing and screw sets are also available, should you wish to make up bespoke sizes. 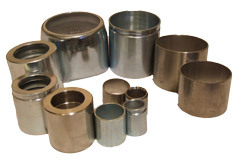 High torque clips are available in stainless steel and range in size from 25mm to beyond 300mm. Ideal for low to medium pressure applications. O-Clips are available in mild steel and stainless steel and are used on low pressure applications. There are two versions, single and double eared. We supply and use Bandit hose strappings systems. This method of hose fitting attachment is permanent and is more suited to the larger bore hose assemblies on low to medium pressure applications. Bolt type clamps are ideal for higher pressure applications and for larger bore hose assemblies. This type of clamp forms a more robust means of attachment. Typical applications are steam, high pressure water and compressed air. See page 8 for related fittings. Ferrules form a permanent hose end fitting attachment and are used on high pressure applications. Ferrules are mainly used for hydraulic, P.T.F.E, Food grade and composite hoses and are available in mild steel, stainless steel and aluminium. Crimping rings are designed for medium pressure applications. They are a permanent way of attachment. Available in Stainless Steel.